4K versus blu-ray versus DVD - Why do we never see a comparison? The problem with any comparisons between resolution from 4K to blu-ray and regular DVD is that people look at many different aspects of the image to decide if it is clear or sharp. We see light intensity and patterns much more accurately than color. I think that TV manufactures are reluctant to publish comparisons because selling HD TV's happens best when the customer comes in and looks at the product, not by math and charts. Blu-ray compared to broadcast HDTV cable, satellite or over the air (OTA) broadcast is another issue. Blu-ray is still better than all Broadcast HD which compresses the image more than blu-ray. Blu-ray comparisons to cable HD and OTA is not covered in this study. This study is based on principles of acceptable focus in still photography. Photographic and cinemagraphic lenses are made with depth of field values (what is sharp). If you hold a photograph 10 inches away most people with 20/20 vision can see points that are 1/1500 of an inch, 20 inches away 1/750th of an inch, 40 inches away 1/325th of an inch, etc. So, it is an accepted photographic standard that the person with 20/20 vision sees any detail smaller to be sharp. At what viewing distance do different sized TV's reach that sharpness level where, if the image were any sharper, we couldn't see the difference? It depends on the TV size the format DVD's or blu-ray or 4K. Since standard TV are no longer essentially a large market segment. The DVD resolution comparision that used to be here has been eliminated. If someone is still interested in that summary, please send me an email. The above charts show at what distance, the average user with 20 / 20 vision will no longer be able to see each screen pixel. The charts are set to show any line above 100% as being higher res than human eyesight can see. A lower percentage does not mean that the image becomes that much worse. It just means below the 100%, people can start seeing individual pixels. The screen viewing angle shows how wide the TV screen will appear when sitting some feet away. 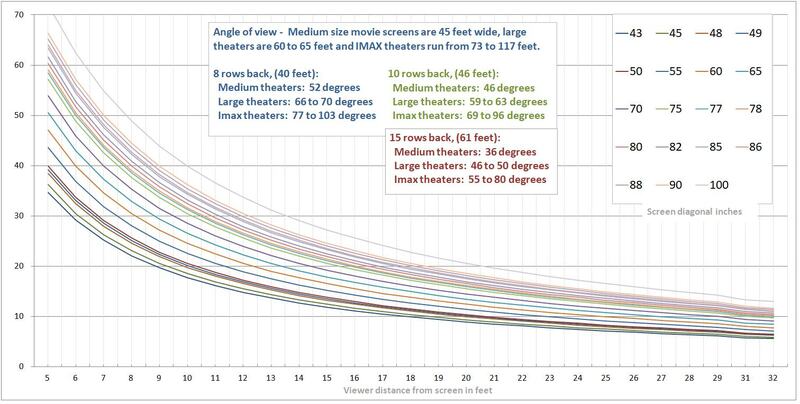 If you want to match the experience of a large theater 15 rows back and your chair, at home, is 8 feet from the screen, you need a screen width angle coverage of 46 to 50 degrees. Look at 8 on the bottom of the chart and follow that line up to 46 to 50 and the TV screen sizes that match are 82, 85, 86, 88 and 90. Another example would be take 15 rows back, Medium theater at 36 degrees and your home viewing distance is 12 feet. Take the bottom line 12, follow up to around 36 and only the 100 inch TV will fit this setup and match the experience of sitting 15 rows back in a medium theater. If 15 rows back is still not your preference and you prefer sitting further back in the theater, then just drop down a few sizes in TV's to get your matching experience at home. Generally, you can get close, but have a hard time to match the theater experience, unless you are normally sitting in the back of the movie auditorium, or you sit 6 to 8 feet to your home TV screen. Trying to match, exactly, the experience of a movie theater in your living room, is not such a fair comparison. Most people are comfortable with screen sizes that fit the room. For Close-up, a blu-ray will always look better than a DVD. An viewer sitting closer than 24 feet watching a DVD on an 80 inch screen, can see individual pixels. They cannot do that with blu-ray unless they are within 10 1/2 feet. For normal viewing distances, blu-ray always looks better until the viewer gets so far away that they can no longer see the difference and DVD resolution begins to appear similar to blu-ray. For an 80" screen, this only starts to happen when the viewer is beyond 24 feet away. Some people with better than average vision, will probably still see a pronounced blu-ray improvement up to about 50 feet for an 80 inch screen. If you have the smaller 40" screen and show a blu-ray, you are not taking as full of advantage of the better resolution. At close viewing distances, blu-ray always looks better, but after 13 feet for average eye-sight, the difference is less noticible and after 26 feet for better than average eyesight, the sharpness begins to look the same as a blu-ray on a 40" TV. This does not take into consideration the other improvements of the codec compression for color, clarity, contrast, motion artifacts etc. that blu-ray technology has over DVD. This test is only for visual sharpness. 4K takes the quality to another level. The issue today, is that not much is broadcast yet in 4K. Streaming is available online with some shorter selected videos. Some of these may be enlarged versions of 1080 P. There is real, uncompressed 4K used in film making and post production houses, but it is not something available online or broadcast, nor is it really needed. Such master quality is used for layering special effects and making editing masters to create compressed versions for movie house projections. Plan your home theater space? Okay, you can stop puzzling over the charts, here are the numbers based on a home theater space. Unfortunately with DVD, you can never approach 30 degree viewing, let alone 45 degree which some people claim as ideal. For all blu-ray sets, 30 degree viewing angle is fine. There will be no degradation of image for getting this close. For standard DVD's to seem to match that sharpness, the viewer needs to be much further away where the monitor appears to be 14 degrees left to right. In other words blu-ray will always make a difference unless you watch TV from very far away. Viewing angle, left to right, at the distance of maximum sharpness for DVD playback is 14 degrees for all screen sizes. If you view a standard DVD at this distance / angle you will be at the limit of an average person's eyesight so it would be difficult to tell if the playback is a standard DVD or a better, blu-ray DVD. Moving closer, you should begin to see individual pixels. If you are closer than this distance it should be easy to see the that blu-ray resolution is better. Most people's living room viewing distance is between 10 and 12 feet. You now begin to need to sit further away then average to not notice that DVD is lower sharpness than blu-ray. This is the max distance, most people will allow for sit down, full attention TV viewing. Definite advantage now goes to blu-ray for sharpness. People normally do not sit more than 15 feet from a TV. Even if someone were to sit this far away, there would be other chairs closer to the screen. Again, Blu-ray has a large advantage for living rooms this large. A viewer closer than 21. 6 feet can start to see that DVD resolution is noticeably less than Blu-ray. Anyone sitting further away will not be able to see much difference. Viewing angle, left to right, at the distance of maximum sharpness for blu-ray playback is 30 degrees for all screen sizes. If you view a blu-ray DVD at this distance / angle you will be at the limit of an average person's eyesight, so moving further away should result in the resolution remaining similar. Moving closer, you should begin to see individual pixels. The blu-ray maximum sharpness distance is always closer than the Standard DVD maximum sharpness distance. So, at watching blu-ray will allways look much better, out to the Standard DVD maximum resolution distances listed above. This is very close to view. The pixel size is at the limit of 20/20 eyesight at this distance. Closer, we would notice resolution go down, further away, we will not be able to see much difference in resolution. A larger screen is useful. Still very close. A larger screen is useful. Still too close. A larger screen is useful. Almost 7 feet viewing distance is about right for a small living room. The perceived resolution will lower if you sit closer. This is an optimal size for a small living room. Middle size living room - 8 foot sitting distance. The main seats should be at least 9 1/2 feet away from the monitor. People sitting closer will begin to see some pixelation. Limit of 20/20 vision to see pixels on the screen. If you are sitting closer than 18 feet, to this TV, larger screens will show some pixels. You only need a larger TV, if you like larger screens. Limit of 20/20 vision to see pixels on the screen. The screen looks 100% sharp for distances of 19 feet and greater. This is the average top limit of distance that most people will ever sit away from a TV. Using a 50" TV means that anyone sitting at 20 feet or futher will not be able to see individual pixels. So, the only reason to go larger is that you prefer a wider view when watching a movie or for some extra features on the TV. At 22 feet you are beyond the range that most people will sit to watch. If you normally sit closer, consider getting a smaller TV, because the image will actually appear sharper. This distance of view is beyond most living rooms. The image will look excellent but at 24 feet away and further it will not appear to get any sharper. Buy this size to get the viewing angle, not a sharper image.